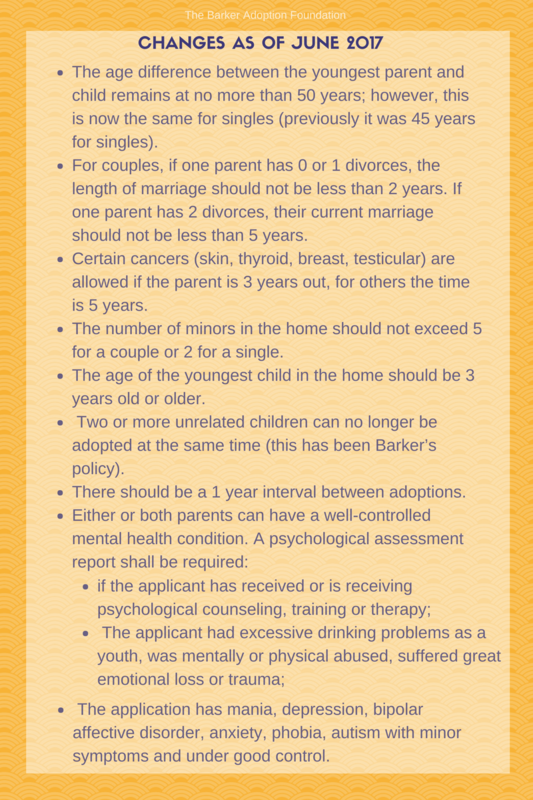 China sent out a notice on July 6, 2017 with some changes to the guidelines of who can adopt. These changes were to go into effect immediately (the notice was datedJune 30, 2017). We have confirmed that these new rules only affect families whose dossier is submitted June 30, 2017 or later. Families that already have Pre-Approval for a child as of June 30 are also grandfathered. We have contacted all of our current families that could potentially be affected by this change. The complete notice of the changes can be seen on the password-protected section of our website. Please feel free to contact Betty our International Program Case Manager or our office +1-301-664-9664 if you have questions or concerns regarding this change.